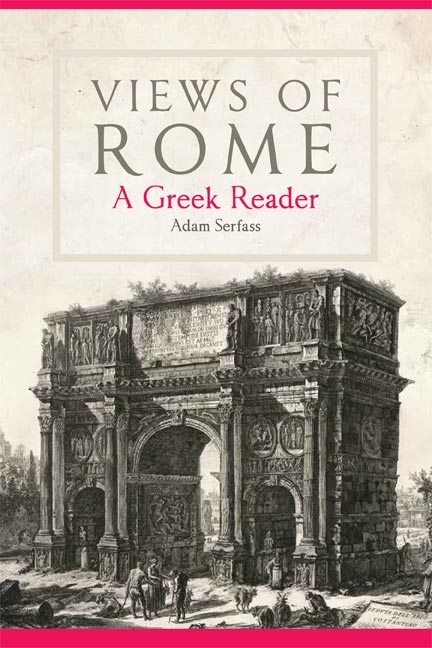 Adam Serfass, Views of Rome: A Greek Reader, Norman [OK], 2018.
Who were the ancient Romans? Views of Rome addresses this question by offering a collection of thirty-five annotated excerpts from Greek prose authors. As Adam Serfass explains in his introduction, these authors' characterizations of the Romans run the gamut from fellow Hellenes, civilizers, and peacemakers to barbarians, boors, and warmongers. Although many of the authors featured in this volume—including Augustus, Cassius Dio, Dionysius of Halicarnassus, Eusebius, Josephus, Julian, Libanius, Plutarch, Polybius, Strabo, and the writers of the New Testament—are important sources for Roman civilization, their written works are rarely presented in accessible Greek-language editions. These authors wrote in a variety of styles and dialects, and this collection enables readers to experience the range of expression the Greek language makes possible. Views of Rome is divided into five parts spanning early Rome through late antiquity. Within these parts, each prose selection is prefaced with a description of the featured author and the larger work from which the excerpt is drawn, as well as suggestions for further reading in English. The Greek passages themselves are accompanied by notes that provide crucial assistance for understanding grammar and vocabulary, thus enabling students to read the language with greater speed, accuracy, and nuance. Designed for advanced undergraduate- and graduate-level readers of Greek, this student-friendly book bridges the worlds of Greece and Rome and inspires discussion of identity, empire, religion, and politics—matters much debated in classical antiquity and in the present day.